Though this Gothic Revival church in Cameron was built in 1916, its congregation descends from one of the oldest continuously-worshiping Lutheran congregations in the state. In 1735, a large population of German immigrants settled in what are today Calhoun and Orangeburg counties. South Carolina had established townships in these locations, promising land to new settlers in hopes that the communities would help defend the existing European population, primarily English, against Indian attacks. This church began in 1844 as Mt. Lebanon Lutheran Church, an extension of its parent church, the historic St. Matthew’s Lutheran in neighboring Creston. 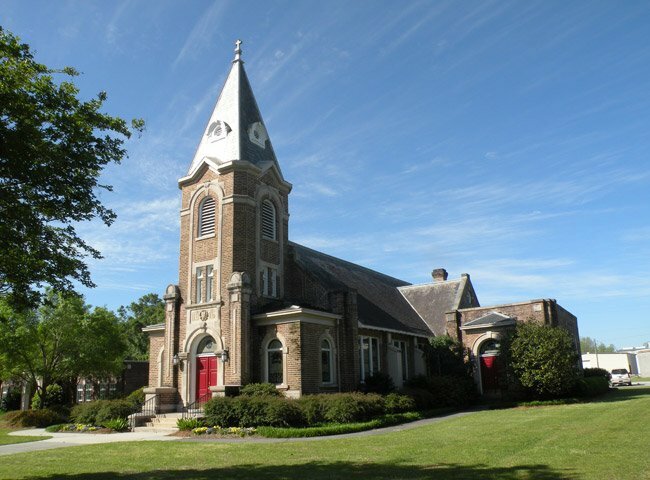 St. Matthew’s planted the seeds of numerous Lutheran congregations in the sandhills of South Carolina. When Mt. Lebanon moved two miles up the road around 1916, it was renamed Church of the Resurrection. Today Resurrection Lutheran Church is in a dual parish with St. Matthews Lutheran Church, meaning they share the same pastor. Hello, Betty! The website above the map should help you with information about this church’s schedule of services. Best of luck! We just moved here and would like to know Sunday church services? Also Christmas eve service times?